We’ve been busy bee’s here at Trail House and we’re starting to dive into this community in more ways then we originally dreamt we would. Not only do we have this bicycling thing down, and the best coffee thing; but we also have the cafe which has taken off like crazy this year. And then lets talk about the beer. The beer we have on tap is not just good… it’s amazing thanks to our community partners and the hard work from our own beer team. Anyway… I digress. Because we’ve had our hands in so many pies and because we’ve been having so much fun with all of our projects, we thought we’d start updating you on how those events turn out after the fact. We also want to take the time to introduce you to our business partners, our community and our passions in a deeper way. Hence, Happy Trails! Our new blog. Think of it as your way of testing some of our events out before you come in to them. Think of it as meeting us before you ever walk in the building and really getting to know who we are so that when you choose to spend your hard earned money here, you know that you made the right choice. This past week we were lucky enough to headline Outside Online’s list of best local bike shops across the company. Check the article out here: https://www.outsideonline.com/2392334/best-bike-shops-america. Reading the brief bio the author wrote about Trail House inspired us to dream even bigger than we already do. I myself am the newest addition to the Trail House team. Not only am I super excited to be in a different environment after being in retail for 20 years, but I am impressed every single day by what we collaboratively want to offer and what we get to execute. We have such a dynamic team and everyone plays an important role in the evolution of our humble shop. Going forward I’m looking forward to introducing you to our team through this blog. We also have some highly impressive regulars who I can’t wait to interview and introduce you to over time. We have some amazing people who come to this place with great stories to share. Before I close the first edition of this blog, I’d like to recap the events we’ve hosted or participated in within the last month. Something may strike your fancy and you may want to pop into the next one. We had our first ever industry night a couple of weeks ago. We all had a blast. Not only did we get a special edition beer from our friends at Alvarado St., but we had a DJ that night to keep the mood high and fun. We’ve decided to host an industry night to any of our friends who are in the bicycling, outdoor, beer/wine or coffee industry on every last wed of the month. Please come and join us if you’re around this month. Come relax and get to know us in such a fun setting. We’ve also been co-hosting a Pub Run on the first Wed of every month with our partners at Fleet Feet. We just had that run last Wed night and it amazed me. So many area runners came out to do an Annadel run in the rain and everyone looked like they were having an amazing time. The enthusiasm was so palpable that I may be doing that myself from now on just to try something new in the community. Please come and check that out this spring if you’re looking for a new , healthy activity to get in to. Great group of people who are challenging themselves physically and then coming here to Trail House after working hard on the trails to reward themselves with fun food and beer. The other rad program we’re testing out is Tipsy Yoga. Yes. I repeat. Tipst Yoga. We’re starting out every Saturday morning with our talented, resident yoga teacher, Kayla Medina. She takes us through our flow from 7-8am as we learn to breathe. Then we serve you bottomless Mimosa’s to REALLY get your weekend off to a bang. All that is only $25. Please come check it out. It is a good time. Find your zen and then find your spin. Lastly, If you haven’t heard about the demo programs our rad bike vendors allow us to have here, you are missing out. Please take a look at our calendar and come to our next event. 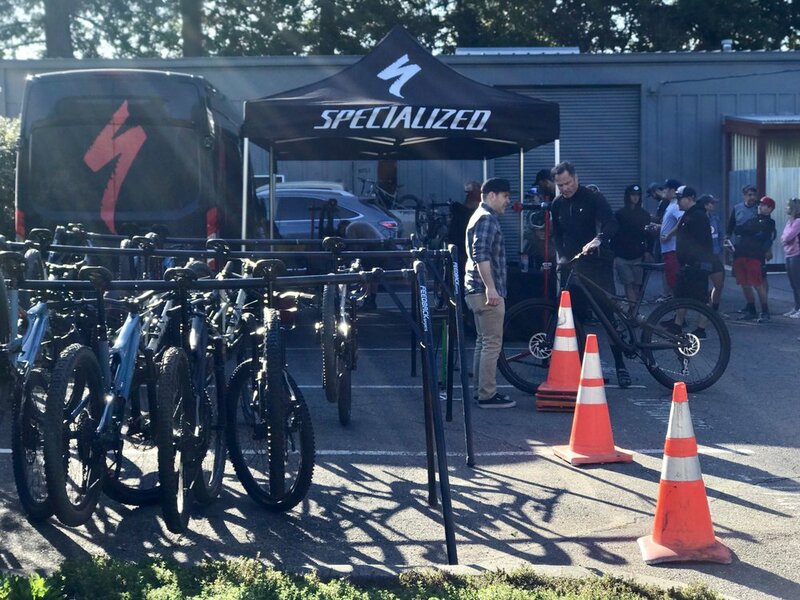 We hosted Specialized here last Saturday morning. They brought out a small fleet of their best bikes and let those who lined up and signed up in time take them out for a spin in Annadel for a while. That way, before you invest in such a high profile, high performance product, you know that it’s perfect for you. We offer that here on the daily for a fee, but the excitement and fun generated by having our vendors come out and host these events once a month or so really gets the vibe going. And you get to talk to someone involved in that company and get extra guidance around your investment. If you’ve taken the time to read this blog today, thank you so much. I look forward to seeing you around the shop. Honestly. The greatest source of joy for all of us here is helping you have the best day ever while you exhaust yourself physically out on the trails and then come reward yourself for the goals you accomplished. Or if you just want a new place to sit and take a lunch break, wind down after work, meet up with friends; we want to serve you and offer you a place to bring your personal community together. Coming soon in our next few blogs: the secret to making the perfect breakfast burrito, an introduction to The Wolf Pack, and How to Breathe; lessons from the yoga mat.